Today, I'm bringing on some serious yum! I came across this recipe, went and bought the protein, made it and am posting about in all in a 2 day span, which in itself could be a record. (Mind you I still have atleast a dozen other recipes that are vying for your attention, they've been made and clicked and are just waiting to be posted). This one just had to be shared with you at the earliest. It is simple, doesn't take too long, but it is so tasty, it would be a crime to not share it with you. I usually make my favourite pork curry and we enjoy it. Apart from that, I've only ever made these pan-fried pork chops and thats how long my pork recipe repertoire is. Now that's just wrong and needed to be fixed. You will see a few more pork recipes coming up. When I was on the lookout for some interesting ways to cook pork, I came across this recipe. 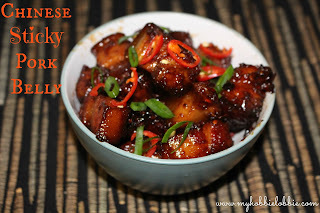 I have heard so much about how good pork belly is and also how good a sticky Asian glaze can be, so obviously the two together had to be even better, right? I was so right. The original recipe calls for the pork to be cooked for 2 whole hours. While I've done this before when I didn't have access to my pressure cooker, I knew I wasn't going to slow cook it this time. I used my pressure cooker and in about 15-20 minutes achieved the same lovely tenderness. If you haven't tried using a pressure cooker before, you should. Maybe borrow it from a friend and see if it works for you. I use mine all the time. I use it to cook meat, boil dry beans (instead of buying canned ones), boiling potato and beetroot and so much more. I cannot imagine life without my pressure cooker. Oh wait, I did have to wait for a whole year before I got mine from back home and it wasn't fun. It just cuts down cooking time drastically and you save on gas/energy by cutting down on cooking time. That's a win-win in my book. I hope to share more pressure cooker recipes with you in future. Back to the pork belly. There's beautiful flavour in the meat and the glaze is just a wonderful bonus. One thing I should mention is be very careful when the meat is in the pan, there is a lot of serious popping that goes on and you don't want to burn yourself. Frying the pork adds some lovely crunchy bits to the pork. So you end up with tender, succulent meat, crunchy bits and a sticky glaze. Yum!!! I served this pork up with a bowl of warm noodles and some stir fried Asian greens. Cut the pork belly into 4 quarters. 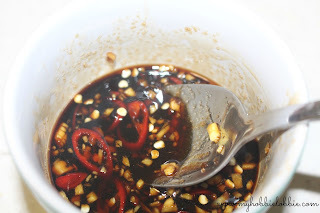 Marinade with the ginger paste, garlic paste, salt, vinegars and sugar for 10-15 minutes. Add 2 cups water and close the pressure cooker. Put the whistle / weight on and bring to a boil over high heat. After a whistle, reduce the heat to low and let it cook for about 12 minutes. After 12 minutes, take it off the heat and let the pressure drop naturally. Carefully take the pork out. Cut into bite size pieces. 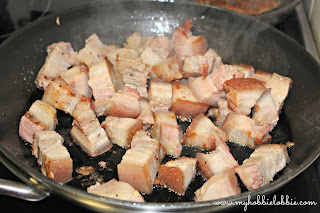 In a large pan, heat 1 tbsp of oil and add the pork pieces, salt and pepper. Fry on a high heat till the pork starts turning golden brown. Be careful while frying the pork as it will pop and sputter while frying. Mix the remaining glaze ingredients in a small bowl. Pour the glaze over the pork and cook till the pork looks dark and sticky. Stir frequently. Do not leave unattended - you do not want the pork to burn. Once the glaze has thickened, garnish with some finely sliced chilly and spring onions and serve with some noodles or rice and greens. Hi Trisha this is looking so sticky and yummy! 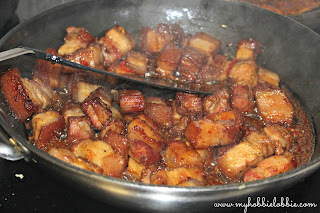 Never thought of using my pressure cooker to cook pork belly..so fast and easy. and a lovely blog to read too!